One of my favorite pieces of technovelgy is the finger watch, from The Puppet Masters, a 1951 novel by Robert Heinlein. It's easy to see how to implement it today, with tiny circuits and LEDs; not so easy to visualize in 1951. The Calendar Ring from Open! 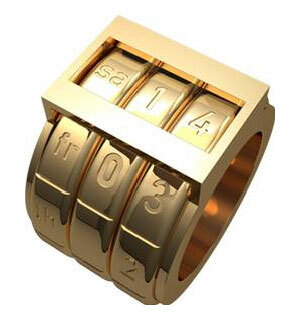 Concepts design offer a mechanical version of a similar idea, a calendar ring. From Open! Concepts via Calendar Ring (Mocoloco).